The Great Coat And Tie Experiment: Caught Up! Another Mickey tie. Two is two too many for some but the pattern on this one is also less than obvious. Another Disney World label and also made in China. This one is a woven rather than a print so it's a little more substantial than Tuesday's tie. 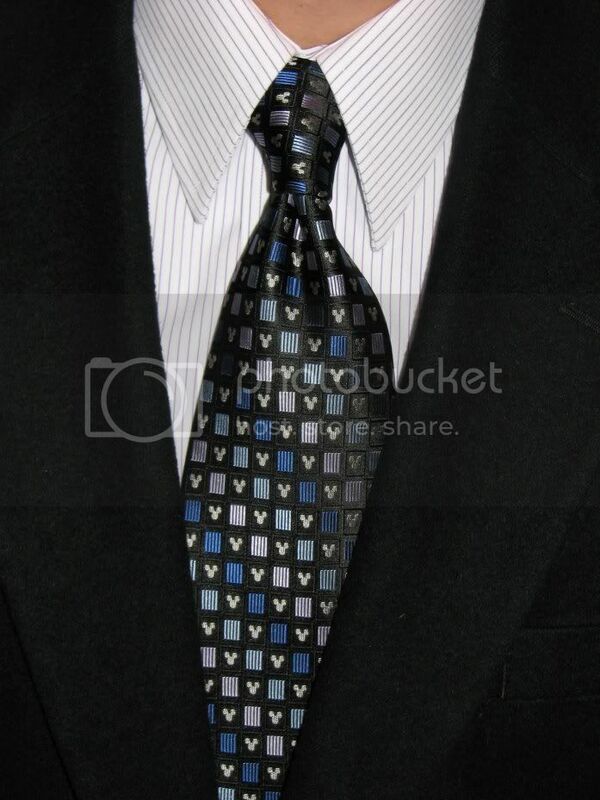 I conglomerated it with a purple stripe, straight collar dress shirt and black sportcoat. The purple stripe in the dress shirt really pulled out the light purple squares in the pattern. Not bad at all and what I was hoping would happen. Sadly I spilled my first up of coffee on the shirt and had to change to a plain white. I did manage to miss the tie though. The shirt will wash (pretreated immediately!) but ties do not clean very well. So that's it! I'm all caught up now. I'll be starting my new job on June 25. I'm really not sure if I'll be able to continue my conglomerating or not. I know that first day will be conglomerated and maybe I'll ask if there's a ceiling to the dress code rather than a floor. I really do hope that I can continue but if not then it's been fun while it lasted. Welcome back! I hope your new dress code allows you to continue conglomerating. You were within 50 miles of me when you were on vacation in Orlando. I enjoy your description of Boulder; I spent a great summer there some years ago. The subtle Mickey ties are really great - especially pleasant surprise in your congloms. 50 miles! That's pretty close. The weather was absolutely perfect while we were there. We did get a bit of Barry wetness the last two days but it sure shortened the lines at the water park on Saturday! Boulder's a great town. I'll bet you did have a good time that Summer. Those Mickey ties are going to be favorites for many, many years.